The Scots Greys (2nd Royal North British Dragoons) will forever be associated with their famous charge at Waterloo, but far fewer people will be aware of their role in the charge of the Heavy Brigade at Balaclava. With other dragoon regiments they attacked a numerically superior force of Russian cavalry and dispersed them, thus writing another glorious chapter in their history. In 1854 the Greys had seen virtually no action since Waterloo, and their uniform was still quite similar. The famous bearskin continued to mark them out from other British regiments, but there were few other differences between these and the rest of the heavy dragoons. The figures in this set have been accurately sculpted with the correct uniform apart from the omission of the cap pouches that should be on their waist belts. None of the figures have sabretaches, which is correct, although some sources suggest that senior sergeants and officers did have them. The bearskin is correctly sized, although the small socket in which the plume would be fixed when on parade has been sculpted in an 'S' shape rather than as a grenade. We liked most of the poses on offer, although it should be remembered that during the charge of the Heavy Brigade no firearms were actually used. However since firing the carbine is something the troopers were expected to do on occasion, the inclusion of such figures here is perhaps not unreasonable. The figure falling is absolutely superb, and when placed on the falling horse produces the most dramatic and exciting cavalry pose ever committed to 1/72 scale plastic in our opinion. Since this figure has parted company with his bearskin, he could serve as a member of any of the dragoon regiments, which is great. On the down side, no flags were carried into action by the British cavalry during the Crimean war, so the man holding the standard is only useful if the standard is carved away (which is easily done) and a sword is substituted. With several figures clearly not engaged in a headlong charge, this set is more flexible in its potential uses than many other Strelets cavalry sets. With 12 different horse poses there was the opportunity to portray horses in all stances, and that opportunity has been taken here. 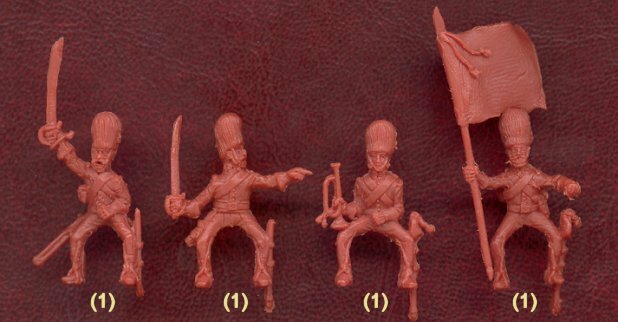 Six of the poses come from the set of British Heavy Dragoons, which were a fairly dull but reasonable selection, but adding six new poses allowed Strelets to stretch their wings, and stretch them they did, with two standing poses, one rearing and another falling in dramatic fashion. As a result, the man firing the carbine has a stable mount from which to do so, the officer can be on a horse patiently waiting for him to move on and the afore mentioned falling man can be placed on a falling horse to such extraordinary effect. This then is the widest variety of cavalry poses yet seen in any set. Nearly all the horses have round valises, which the records tell us were used exclusively by the Greys at Balaclava, but the horses brought from the other Dragoons set have the erroneous straps around the belly, a fault that is corrected for the six new animals. The standard of sculpting is reasonable, with no flash or other problems. The men fit the horses well, although some fit some horses better than others (this is apparently by design). All the men have carbines apart from the officer and trumpeter, which is fine, but the latter has only been given a trumpet (used for camp calls) and no bugle, which was used for calls in battle. Still overall this is a very nice set which effectively completes the required sets to depict one of the most famous incidents of the battle of Balaclava, and indeed of the whole Crimean war.